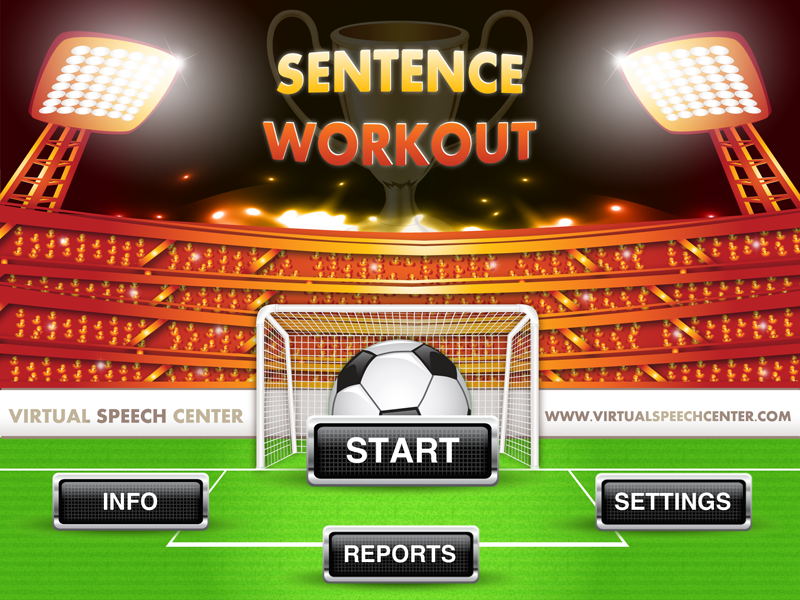 You've played the Auditory Workout basketball-themed application from Virtual Speech Center, now play the soccer-themed application that works on sentence structure! Sentence Workout focuses on age-appropriate syntax while adding a motivating sports theme and reward game into the mix. With a hierarchy of sentence structure types to practice, this application can be used across multiple ages/grades, with multiple students, and as children individually progress. To learn more about how this application, continue reading! The "Main Page" of this application includes four different buttons: Info, Settings, Report, and Start. Pressing the "Info" button will bring you to the Information Page. This includes how to use the app, a description of the population it is intended to be used with, and what is included in the application. In addition, there are four different buttons to follow Virtual Speech Center on social media, visit the website, or subscribe to their newsletter. To begin application play, press "Start". Then, if it is your first time playing the app or you need to add a new student, press the "Add Student" button. Then, type the students' name into the white rectangle. Then, press "Save". Next, select a student or more than one student by pressing on the name(s) and a green checkmark will appear next to the selected name(s). Once you have selected the student(s) to play the app, press the "Next" button. On the following screen for each student, choose the activity/activities to be practiced. Say It - This activity requires the user to state a sentence aloud using correct syntax depending on the sentence structure/type chosen. If audio is enabled, the narrator will state a probe sentence with emphasis on the concept(s) to be included in the elicited sentence stated back. In addition, you can choose to have the user record his or her sentence and play it back to self-correct. Create Sentence - This activity requires the user to put words in a sentence in order by pressing, holding, and dragging the words to their spots in the sentence. When a word is pressed, it will be stated. When all parts of the sentence have been placed, if audio is enabled, the narrator will state the sentence as is and it will be marked as correct or incorrect. If not, the speech-language pathologist must score the sentence and it will not be stated aloud. Then, select the sentence types to be practiced. There are 37 sentence types that have over 350 sentences total (approximately 10 pages per sentence structure type). You can select one or all of them. Once you have chosen the sentence structure type(s) to be practiced, press "Next" . If there is more than one student, the next student will appear to choose the activity and sentence structure types. If the student has used the application before, his or her settings will be entered already, but you can change them. Before the activity begins, a soccer coach will introduce the application. He will also state that as a reward, the user will be able to shoot soccer balls at a goalied net for a game between a certain amount of sentences. You can skip this intro by pressing the "Skip" button. Depending on which activities are chosen and the sentence type, the first user's name to play the application will appear at the top of the screen and the trial will appear as well. When a user correctly completes or states a sentence, press the green checkmark button and a sound will play. If incorrect, press the red "x" button and a different sound will play. Then, press "Next" to go on to the next trial. If you have chosen to allow the reward game, depending on how many trials you have set it for, it will appear after that number have been completed. The soccer coach will state, "Congratulations, you can now play a soccer game! Would you like to do that now?" Press "Play Game" to play the soccer game reward or "Not Now" to continue with sentence trials. The child can then flick soccer balls at a goalie for a period of 10 seconds. When the time is up, his or her score will appear, then you must press the "Finish" button to return to the sentence trials. A percentage of accuracy will appear on the right hand side of the page in between the correct and incorrect trial buttons. To hear a trial's instructions stated again, press the arrow button in a circle. To hear the sentence correctly stated aloud by the narrator, press the speaker button. You can also choose to have the student record his or her sentence by pressing the red circle button to record, red square button to stop recording, and the green triangle button to hear the students' sentence replayed. Finally, the trial number out of the total number of trials is shown next to the students' name. When you are done playing the application, press the "Finish" button. The coach will appear and you have the options to return to the Main Menu, play the soccer game, or View Report. To view a report for a student, you can press "View Report" at the end of application play or press the "Reports" button on the Main Menu. Then, you will see a list of users whom have been entered into the application and have used the application. This list is in alphabetical order on the left hand side of the page under the "Select User" text. You can delete reports for a user by pressing the pencil button and then the red circle with a minus button, followed by "Delete". You can organize the reports on the right hand side of the page by pressing "By Activity" or "By Date". Then, to view a specific report or group of reports for a certain skill by selecting that skill or date on the right hand side. Then, the activity or session report will appear with a graph showing the client, activity, session date, activity, and accuracy. You can then e-mail the report by pressing the "E-mail Report" button. This will copy-paste the graph into the body of the e-mail. In order to e-mail the report, you must have your e-mail connected to your "Mail" application and internet access. I like the fact that the application is multiplayer and students can be working on different goals. It is great that a student can work on more than one goal within the application. You can change the sentence type that the student is working on as they progress. Sentence types are organized in a hierarchy from verb+noun to noun+verb+adverbal clause. 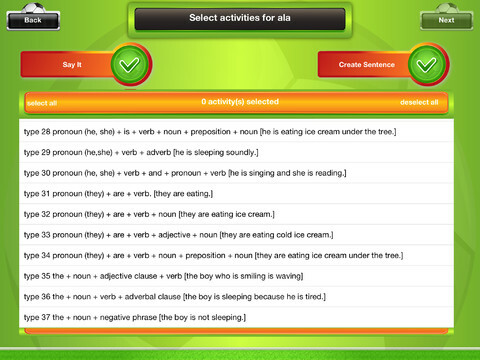 In addition, users can practice sentences in two different activities ("Say It" and "Create Sentence"). The application keeps data during application play and allows for e-mailing progress reports. You can also view progress on a goal over time. The reward game makes the application motivating in addition to the fact that the entire application is based on a soccer theme. This application has similar settings and buttons to some of the other Virtual Speech Center applications which makes it easier to navigate if you have used other applications from the company. I would like the ability to switch between sentence types or users (when playing with multiple users) like in the Articulation Games application; however, I also like the fact that it moves between players automatically. There is a lot of information on how to use the application in the "How to Use" and "Description" areas, but the spacing between the "Description" paragraphs is a bit cluttered. It would be nice if there were also a video showing how to use the application embedded or linked to within the application. Articulation/Fluency/Voice - Have the user state the sentence using his or her best speech sounds, fluency strategies, or vocal strategies. He or she can record and play back his or her speech to self-assess. Receptive Language - Children can learn different nouns, categories, adjectives, prepositions, and verbs by using this application. They can also hear learn how they are used within a sentence. 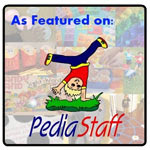 In addition, children can think of additional adjectives to describe various nouns. Syntax - The main focus of this application is to improve sentence structure and expand sentences as well. In addition, there are 37 different sentence types to practice. Finally, there is a hierarchy of sentence types from simple sentences to complex sentences. Use the "Create Sentence" activity to place parts of the sentence in the correct order. Expressive Language - Use the "Say It" activity to have children practice creating a sentence based on a prompt/photo. Sentence Workout is available for the iPad for $12.99. Don't forget to vote for this app on Yapp Guru! 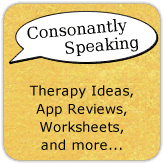 Consonantly Speaking was given a copy of the application to review. No other form of compensation was given.